2-26-15 - This book is currently on backorder from the publisher until at least 3-15-15. Please contact us before ordering if you need it right away! Secrets of Solo Racing by Henry Watts. 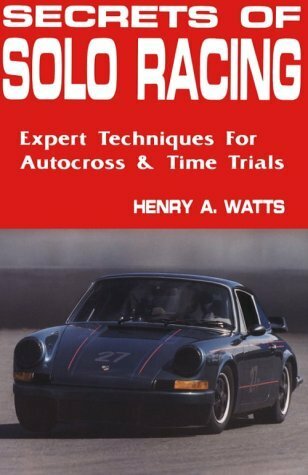 This handbook for Autocross and Time Trials introduces the sport to the beginner in terms that are understandable. It also provides expert guidance to advanced enthusiasts.The book covers everything from “What is an apex?” to proper lines through various types of corners. It even covers what to bring to the track and what to expect when you get there. Road & Track: Watts instructs carefully and well. Those of us who … thought we'd mastered the science of speed … probably would have done a lot better curled up on the couch with this good book. Grassroots Motorsports:The best book on autocrossing ever written. Sports Car said it best: Excellent instruction.